Is Turkey's Pivot to Russia about Erdogan's Survival? 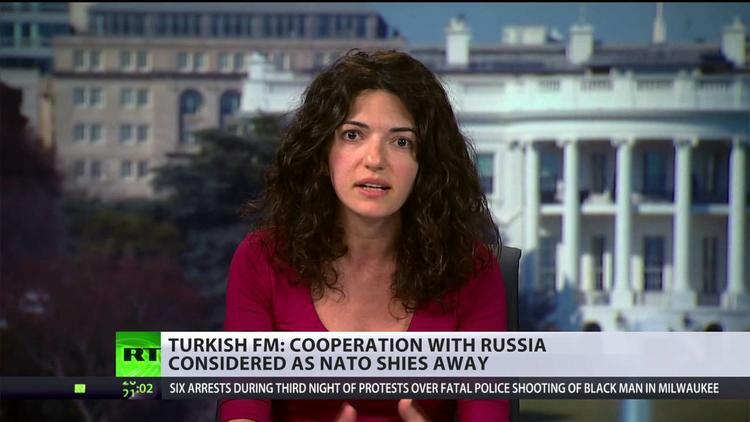 Is Turkey’s Pivot to Russia about Erdogan’s Survival? The attempted coup of July 15, 2016 in Turkey shook that country’s political system to the core. Although President Tayyip Erdogan of the Justice and Development Party (AKP) had broken in 2013 with his former allies, the right wing religious cult around Fethullah Gulen, he appears to have believed that he had tamed it. He survived the members’ leak of recorded conversations pointing to AKP corruption and support of fundamentalist militias in Syria. His party went on winning elections without the Gulenists, who were revealed to have less popular support than they had imagined. So the coup attempt appears to have taken Erdogan by surprise. One important but neglected report suggests that it was the Russians who informed him of the chatter their cyber-spies had picked up from Turkish officers, a few hours before the coup was launched. Russia intensified its cyber surveillance of the Turkish military after it shot down a Russian fight-jet in November of 2015. Several members of Erdogan’s circle, including cabinet ministers, have blamed the United States for the coup, since Gulen lives in the US. Personally, I find the idea that President Obama plotted a coup against the Turkish government implausible (Joe Biden frankly calls the notion “bonkers.”) But that I find it implausible does not stop the AKP elite from believing in it. (I’m also not sure that Gulenist sleeper cells in the officer corps were the only or main element in the plot). It has to be admitted that elements of the US foreign policy elite find Erdogan extremely inconvenient. He did not step up to combat Daesh (ISIS, ISIL), which contributed to its ability to hit Paris, Brussels and Baghdad. He has bombed the YPG Kurds in Syria, which have been the only reliable and effective allies of the US against Daesh. And he has tangled with the Israelis over Gaza, and tangling with the Israelis is not allowed according to the Washington consensus. But it should be remembered that many NATO allies have been inconvenient for Washington at one point or another over the decades (Charles De Gaulle used to give them conniption fits) and it hasn’t been US policy to overthrow those allies in coups. (The US did stage coups, but I doubt any among NATO allies). But let’s just imagine that Erdogan does think that the US was either behind the coup or at least was willing to wink at it (Washington didn’t at the time seem all broken up at the idea), whereas Putin actively intervened to warn him about the plotters’ chatter. Remember that the coup-makers were trying to kill Erdogan, and they could easily have succeeded. This coup was personal. Erdogan would be grateful to Putin, would have gained a degree of trust in his intentions, and inclined to show some gratitude. Erdogan seems to think he can go on winning elections the rest of his life (he is 63) and will have an opportunity to transform Turkey into a presidential system. Those ambitions were almost cut short by mutinying soldiers of his own military. Erdogan is embarked upon a massive purge of oppositionists (they cannot all be Gulenists), with tens of thousands of people detained or charged, including journalists, academics, minor bureaucrats, and even soccer players and others Obviously not involved in the coup. NATO countries are democracies and generally object to mass round-ups with no habeas corpus more redolent of Zimbabwe than Western Europe, and their criticism has stung and inconvenienced Erdogan in his apparent march to a presidency for life unencumbered by a rule of law or grassroots democratic processes. (Admittedly, his enemies, whether the PKK [Kurdistan Workers Party] or the Gulenists, have far less respect for both). Then there is the problem for the AKP government that the US Department of Defense is actively allied with the YPG Kurds of northern Syria and is de facto helping them establish their Rojava, or an ethnic Kurdish mini-state on the Turkish border, in return for YPG help in rolling up Daesh. This policy seems in part to be Secretary of Defense Ash Carter’s revenge on Erdogan for refusing to destroy Daesh. But from Ankara’s point of view, the YPG is a terrorist group. It would be as though a foreign country helped an anti-American Mexican cartel take over Tijuana, posing a perceived threat to San Diego. (I don’t myself see any sign that the YPG has ambitions outside Syria or that it has a command structure in common with the brutal PKK group from which it is descended, but we’re talking about how Ankara sees thing). So Erdogan is pretty done out with Washington. But despite his enormous ambition, he cannot make Turkey, a middle income country of 75 million, into a global power by wishing it so, and needs other countries for trade, technology and military help. On top of Putin’s assistance, then you have the series of Daesh bombings in Ankara, Istanbul and elsewhere, which should have made anyone begin to rethink whether backing or winking at the radical Muslim militias in Syria is really a wise idea, and whether having them come to power in Damascus would really benefit Turkey. Russia sees Daesh in al-Raqqa, Syria, as an extension of radical Muslim rebelliousness that has affected Chechnya and the Caucasus. Google maps says you could drive from Aleppo through Turkey to Grozny in Chechnya in less than 24 hours. And, there are Russian Chechen nationals forming regiments in al-Raqqa. For Daesh to take over Syria (or for the Army of Conquest to do so) would create a radical Chechen base from which Russia could be attacked. Another thing. Erdogan’s arrogance toward Russia in the wake of the plane shoot-down last fall was ill-advised. Putin’s consequent economic sanctions deeply harmed Turkish exporters of fruits and vegetables and entrepreneurs connected to the tourism industry (Antalya, on the Mediterranean coast, had become virtually a Russian city in the summer, but abruptly was turned into a ghost town). Middle class businessmen are one of the AKP’s primary constituencies, and part of the rationale of the party is to enhance their profit opportunities, not drive them into bankruptcy. So Erdogan’s break with the more ideological former Prime Minister Ahmet Davutoglu and his replacement with the pragmatist Yildirim Binali on 24 May was perhaps already a sign that a more pragmatic Syria policy was in the offing. But after the coup, there was every reason to make a new opening to Russia. And you couldn’t do that without adjusting Syria policy. The Turkish government has thus adopted the position that US Secretary of State John Kerry was forced into last February, in the lead-up to the now-lapsed cessation of hostilities. That is, that he dropped the demand for an immediate resignation of Bashar al-Assad as president of Syria in preparation for new elections. Apparently at some points Russia had been willing to consider forcing al-Assad out, but Iran, Russia’s strategic partner in Syria, refused to budge on this issue. And that is what Prime Minister Binali now says is Turkish policy as well. I think all this pivot to Russia business can easily be exaggerated. Turkey has been in NATO a long time and the Turkish officer corps has deep ties with Brussels and Washington. Some of what is going on may be Erdogan flirting with Putin to signal to Washington, Berlin, Paris and London to leave him alone about the mass arrests Or Else. And, ultimately, Moscow and Ankara do not at all see the future of Syria the same way. There will be continued frictions. But it is also undeniable that Turkey’s foreign policy in the wake of the coup is accelerating its pragmatist direction. Better relations with the Russian Federation is part of that process.